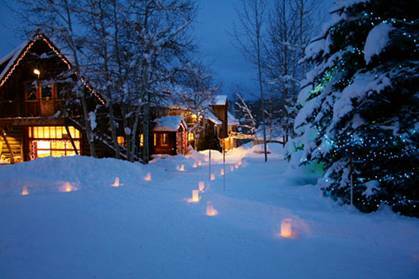 Snowmass Village, CO – To celebrate the holidays the community is invited to follow candle-lit pathways and tour open studios to view the extraordinary work that has been created this fall at the Ranch. Bring your family and friends and join us for the evening’s events and activities. Free and open to the public! Some of the great activities for this year’s event include Children’s Ornament Decorating, ArtWorks Store Jewelry Trunk Show, Live Auction, and Dinner at the Ranch Café. Additionally, we are hosting opening receptions for James Surls: The Black Arts, Joe Cornett’s Basketball Hoops: It’s All the Same and Jacquelynn Woodley’s In a Nutshell exhibitions. (See schedule of events outlined below). During the Open House there will be many opportunities to view and purchase original artwork as wonderful holiday gifts or to build your own personal collection. Fall resident artists and Anderson Ranch artistic staff will offer a variety of their work for sale including ceramics, prints, photography, painting, sculpture and more… As always, Artworks Store will be offering a great selection of high quality, well-priced art supplies, books, artwork, prints, gift items, Anderson Ranch branded merchandise and a terrific children’s section with art gifts for your creative little ones. Children are invited to participate in a free holiday ornament decorating activity. Located in Schermer Meeting Hall. Follow candle-lit paths leading to the studios of our staff and resident artists. ArtWorks store will be hosting personal appearances by jewelry designers Susan Walker of Susan Walker Design and Colby June of Colby June Jewelry. Susan Walker, who exhibits her work internationally, combines various materials such as metals, loose cut stones, pearls, semi-precious beads and found objects from both man and nature to create true works of art. Colby’s most recent collection, Compose Decompose, is a study of two basic elements: sticks and stones. Colby uses a variety of metals including silver, bronze and gold, in subtle and surprising ways. Weighty rock forms are carefully integrated with delicate stick forms. The juxtaposition parallels nature’s cyclical process of growth and pairing away. This exhibition will feature drawings and large-scale sculpture and commemorates the 20th anniversary of Surls’s groundbreaking wall drawing, To Touch the Center, created at Anderson Ranch. On view December 6, 2010 – February 25, 2011 in the Patton-Malott Gallery. Basketball Hoops: It’s All the Same is a chronicle of travels throughout the Southwest, shooting basketball backboards and nets. This body of work is a collection of some his favorite basketball hoops and courts that he discovered traveling with his brother and father. Each hoop is aesthetically different and extraordinary in its own right, yet they all symbolize the love for the game of basketball. Joe describes his attraction to the subject matter in this way: “The players who play there still have their favorite sweet spots to shoot from and each court is shaped differently by the space that consumes it. Whether playing basketball in a gym, in an alley, on the desert floor or in a barn, the reason we all play is universal. The courts we play on will change, but as far as the game goes, it’s all the same.” On view December 14, 2010 – February 25, 2011 in the Gideon Gartner Gallery. In a Nutshell features multiple delicate and poignant collages utilizing a combination of fey designs and figures in poignant combination. Jacquelynn is inspired by the flat pattern, bright color, whimsical designs, elegance and humbleness of folk art. In these fanciful, colorful and spirited compositions she uses the language of Folk Art to address the weighty truths of life and death in an unblinking straightforward manner. On view December 9, 2010 – February 25, 2011 in the Julia and Edward Hansen Gallery. Join us for a special live auction featuring select artwork by nationally and internationally renowned artists. Wine & beer and light snacks will be served. Proceeds benefit the educational programs at Anderson Ranch. The 2011 Holiday Open House is hosted by Susan Beckerman, Lee Eagle, Carolyn Hamlet, Sunni McBride and Tom O’Connor.